The Pig Rooster compatibility can go places, if both the Chinese zodiac signs make some effort. The Pig is a very laid back home body who prefers to take things as they come and is most happy when making other people happy. They tend to enjoy the finer things in life. It is not, however, laziness. The Rooster is what might commonly be called a “type-A” personality. They are prone to classifying every problem as an obstacle, which must be crushed. They are naturally dominant and cannot stand being anything but the center of attention and leader of the pack. This can be an asset in some situations, as long as they have the abilities of leadership, charisma and discernment. Any Pig and Rooster relationship is likely to be based entirely on the Pig taking satisfaction from making the Rooster happy. This has the unfortunate tendency to require that the Pig do just that – to eschew everything in favor of adulation or idolatry of the Rooster. This can easily become, or be construed as, terribly unhealthy for both parties. It will take a tremendous amount of effort by both the Pig and Rooster soulmates to keep any kind of relationship functioning. Communication will be key for the Pig, while keeping a modicum of self control will be paramount for Rooster. When the pig starts dating the rooster, things will be very good in the beginning. As long as it is well understood that the basis of this Pig Rooster friendship will be entirely the Pig working to make the Rooster happy and the Rooster taking pleasure from the attention of the Pig, this could work out quite well. It must, must, must be understood that this is the case. Sexually, the pig and rooster in bed will be compatible, provided both are ready to understand each other’s needs. When it comes to love compatibility, these two Chinese astrology signs can complement each other. It is far too easy for the giving nature of the Pig man or woman to be taken advantage of by a Rooster man or woman who delights only in competition and power. If, however, the Rooster uses its abilities to discern what it is that will make their partner truly happy, this could readily be a healthy and exploratory marriage. In business, friction in the Pig Rooster compatibility can develop if there is any misunderstanding of motives. The male or female Rooster tends to make a natural manager and thrives off of competition and success. The male or female Pig will be unhappy in any work situation in which they do not fully believe in what they are working for. Great success can be achieved if the Rooster and Pig couple agree on the goal to which they are working toward. In this case, The Rooster is best served in an environment where they can take care of the nit picky details of management and make certain that everyone is on track. The Pig provides the major impetus of work. If this synchronicity cannot be achieved, neither party will be happy for long, predicts Chinese astrology compatibility. The Pig will feel put upon and taken advantage of, while the Rooster will feel that the Pig is not putting in enough effort or work. Resentment will build rapidly if this happens and a meltdown is almost inevitable. The dominant side of the Rooster will want to force the Pig back on track. The Pig, meanwhile, is very likely to show the flip side to their normal personality and show just how malicious and vindictive that someone devoted to happiness can be. Then a breakup of this Pig Rooster partnership is bound to happen. 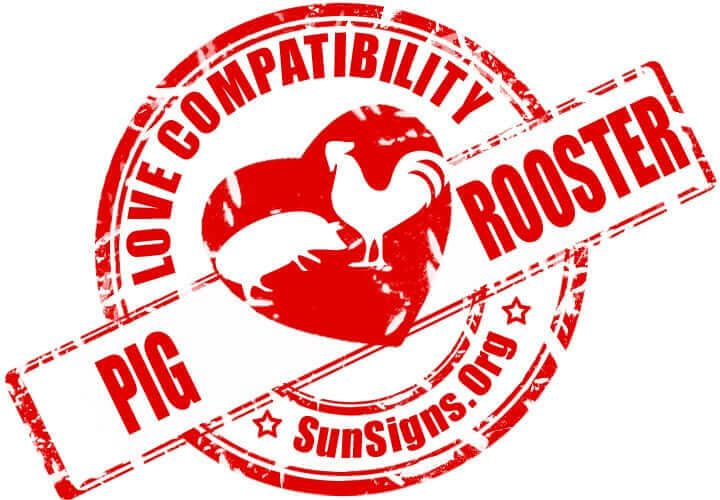 Pig & Rooster Chinese Horoscope Compatibility Rated 4 Hearts!